We currently have two mobile eye tracking systems supplied by Positive Science LLC. These are head-mounted video-based system. This system has both tethered and mobile options. When tethered, video feeds are streamed to a mac and eye position is fitted on-line in real time. The mobile option allows complete freedom of movement for the participant, with video data recorded onto portable digital recorders, or a MacBook Air. The kit is exceptionally lightweight, with recording gear housed in a backpack. 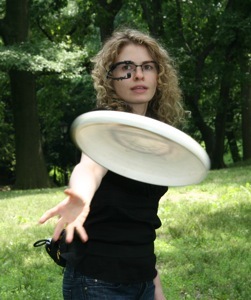 Eye position is calculated using Positive Science’s Yarbus software. This software produces robust and reliable estimates of eye position in both tethered and mobile recording conditions. We have found the options available for setup and calibration to be excellent and allow good tracking in a range of conditions. In the AVL we have an EyeLink 1000+ eye tracker and an EyeLink II eye tracker. We use these eye trackers in a range of projects in the lab. The EyeLink systems are manufactured by SR Research Ltd and have a typical spatial accuracy of better than 0.25 degrees and a temporal accuracy of up to 500 Hz (EyeLink II) or 2000 Hz (EyeLink 1000). 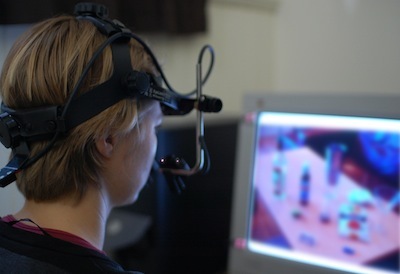 These eye trackers are used for experiments where stimuli are viewed on a computer screen, with the participant seated in front of the monitor. Saccades and fixations are classified using software supplied by SR Research Ltd. Subsequent analyses use MATLAB- and R-based software developed in-house.